One of the most overlooked aspects of making great beer is the fermentation temperature. In fact, fermentation temperature is one of the most significant factors in determining the final quality of the beer. If your fermentor is too cold then your fermentation may never take off, or it may be sluggish and give out before the beer is fully fermented. If your fermentation is too hot, then the yeast will produce off-tasting chemicals that might make your beer taste a little bit like bananas. A hot fermentation can also cause the yeast to speed up too much, and starve out – also leading to an incomplete fermentation. The best way to ensure a full and complete fermentation is to keep the temperature right in the sweet spot for the strain you are using, and to keep the temperature very stable. Commercial breweries have sophisticated ways of controlling fermentation temperature. On the large scales that they produce, the biggest problem they have is dissipating heat. The fermentors they use are “jacketed” meaning there is a thin gap between the outer wall of the fermentor, and the inner wall where the beer lives. The brewer can pump glycol through the jacket to bring the temperature of the brew down to whatever level he desires, and can keep it within a degree or so throughout the fermentation process. Most homebrewers do not have glycol systems. The cheapest ones available run around $1500, putting them well above the weekend warrior’s price level. I put this type of system on my Christmas list each year, but so far SWMBO hasn’t come through with it. So, we improvise. The first step in controlling temperature is knowing what the temperature of your fermentation is. Your local homebrew shop (LHS) probably has an inexpensive “stick-on” thermometer that you can use to get a reading on the outside of a carboy. That’s a good start, but you might also want to invest in another thermometer that can take a reading of the interior of the beer since there can be a difference between the surface temperature of the carboy, and the beer inside. It is far, far easier to increase the temperature of your fermentation than it is to lower it. Therefore, I find that it’s best to put the fermentor in a place that is a few degrees cooler than I actually want the beer to be. I can then use a heater to warm it up to the desired temperature. In this way, if I need to cool the beer, I just shut off the heater, and the ambient temperature will bring the fermentation temperature down. The easiest thing to do is to get an aquarium heater that is designed for reptiles. This will be able to raise the temperature of your fermentation by 5 – 10 degrees F above ambient. These things cost about $15 or so. Do not put the heater on the bottom of the carboy; the weight of your carboy would destroy it. Instead, attach it to the side using bungies or big rubber bands. If you try and tape it to the carboy, it will expand and contract with changes in heat, and pull the tape off. There are also larger heaters that are designed specifically for home brewing that can raise the temperature even higher. If you find that your heater is not up to the task of raising the temperature enough, you can always wrap your fermentor (and heater) in a blanket to help retain some heat. If your fermentor is in a place where the temperature fluctuates, you can always put the heater on a timer (they cost about $15 at your local hardware store). You can set it to turn on at night when temperatures are typically cooler, and turn off during the day. Now that we’ve covered heating up your beer, it is important not to over-shoot your ideal fermentation temperature. There are devices you can purchase from various Homebrew shops that will allow you to set a temperature on a special probe switch that will turn your heater off if your beer gets too hot. These run around $100, and might be worthwhile if you brew a lot. The most important thing is to keep your beer in an environment that has a STABLE temperature. The fewer variables, the easier it will be to maintain a constant temperature in your fermentation. Another important thing to consider is that when your fermentation is very active, it will actually produce heat. As the fermentation slows, the internal heat goes down. So you will need to check on the fermentor a couple times per day to make sure it isn’t getting too hot, or too cold. What if, despite your best efforts, your beer gets too hot anyway? Don’t freak out, there are solutions, and it won’t kill anything if your beer gets too warm for a day or two. Here are some things you can do to bring the temp down. Put the carboy in a cooler place. If you normally ferment in your closet where the ambient temperature is 70 degrees, and you find that the internal temperature during krausen has increased to 75 degrees (not an unusual circumstance), then you might relocate it to the basement where the temperature is 65 degrees. Put the carboy in a bathtub with about 6 inches of water in it. You can blow a fan on the water and it will actually cool the beer off by several degrees because of the evaporation of the water. If you are fermenting in a plastic bucket, you can also use copper tubing to create a heat transfer coil. Using a pump and another vessel (like a cooler), you can alternatively pump warm or cool water through the coil and control the temperature that way. Either way, you want to make sure your cure isn’t worse than the disease. If you cool your beer too much (by putting ice in the bathtub trick), you will cause your yeast to go dormant, and it’s hard to wake it back up. If you heat it up too much, you can cause the fermentation to speed up too much, and that can have other adverse effects on the beer. 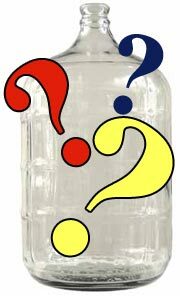 One excellent way to get the hang of it is to fill your carboy with water and practice maintaining a constant temperature with that. This way you won’t mess up your valuable beer if you make a mistake. Once you have found the ideal mix of heat and location, you can then graduate up to the real thing. Keep in mind, however, that the fermenting beer will behave a little differently than water because of the changing exothermic properties of the yeast over the fermentation cycle. For more information on homebrewing, visit www.drunkmansguide.com!